Simply introduce your sample gas flow into the inlet of the Model 906 CO2 analyzer, and see results on the LCD within 15-20 seconds. The inlet accepts a flow rate of 5cc/min to 1000 cc/min. If you don’t have a source of flow or positive pressure, the analyzer can be equipped with an internal pump to draw in sample gas for analysis. The sensor design is compact, has a low internal volume and requires only a low sample flow of about 5 to 1000 cc/min. 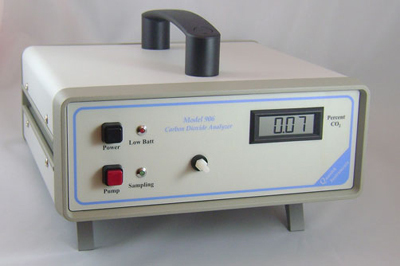 Our market leading CO2 sensor uses the latest in dual-wavelength NDIR measurement principles, reducing drift and allowing for results in as little as 10-15 seconds. While the sample introduced should be clean and dry (non-condensing), should moisture enter the analyzer, the Model 906 is equipped with an internal moisture trap filter. This provides a last barrier of protection, and is user-replaceable (we provide spares). The Model 906 uses a solid-state infrared sensor which has no moving parts, a compact optical cell, and microprocessor-based calibration factors using a 6th order polynomial equation to linearize the full range measurement up to 100%. Infrared CO2 measurements are inherently non-linear, especially over a high range of concentrations. The math algorithm used in the 906 yields more accurate measurements over a much wider range of concentrations than other methods. Sample gas flows into the analyzer through the front panel fitting, and vents out through an exhaust port on the back panel. The exhaust port can also be equipped with a connectible luer fit connection, should you wish to keep your system closed. If you have your own data acquisition equipment already, we can equip the Model 906 with a Vdc or 4-20mA output on the back – linear to the concentration displayed on the LCD. If you do not have data acquisition equipment, we offer a complete data logging solution. This solution allows you to record readings at intervals from 1 second to 18 hours, and comes complete with graphing/analysis software. The results can then be exported via .csv or .txt files to other software for analysis. With its low power requirement, the Model 906 can be operated with an optional battery for those applications where AC power is not readily available, or for convenience if spot checking samples at different locations. A totally sealed, long-life internal 12 Vdc battery accepts a full or partial charging cycle and will operate the unit for up to 8 hours. The charger module plugs into any international 100-240V outlet, for charging or continuous operation. The analyzer need not be turned off during the charge cycle. The Model 906 is backed it up with a two year warranty, twice the industry standard. The advanced design allows an output requiring less frequent calibration. It provides a stable, drift-free linearized voltage or current output that is much less susceptible to external electro-magnetic interference than conventional analog electronics.